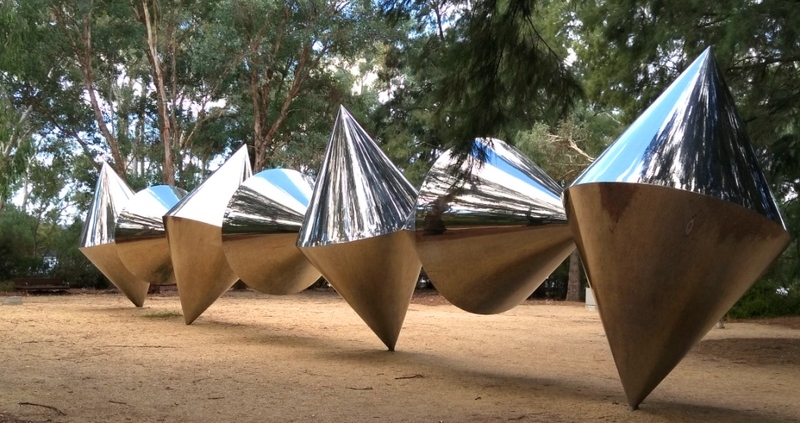 Who are the custodians of public art in Canberra? A few years ago, I contacted the old Territory and Municipal Services Department (TAMs) to express concern about the condition of the iconic Bert Flugelman sculpture located in a corner of Margaret Timpson Park in the Belconnen Town Centre. I had worked there for a number of years and was a great fan of this particular sculpture and had done some research into it’s provenance. Not long after, I had a call from a former head of artsACT. Put simply, there was little, if no money to upkeep, maintain, or refurbish public art in the ACT. Subsequently, a small effort was made to spray weeds and moss. Three years on, the situation is dire. 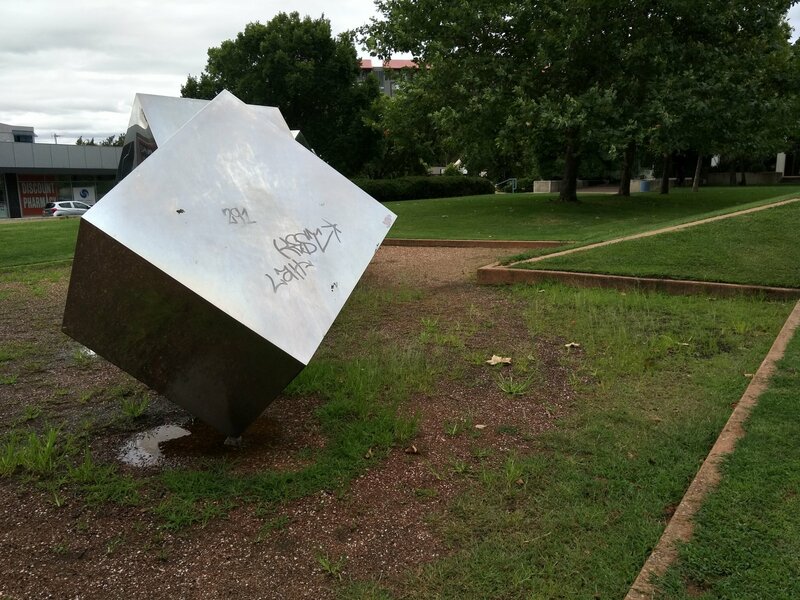 After three major relocations within the Town Centre since the late 1970s, Bert Flugelman’s shiny stainless steel ‘Tumbling Cubes‘ came to rest, rather awkwardly, in a corner of Margaret Timpson Park. It has been jumped on, bashed, vandalised with graffiti and just plain neglected. From a distance it looks OK, and I am sure the people who have purchased units – sorry apartments – in the adjacent tower, enjoy being able to glimpse this important sculpture from their balconies. While amounts of money that some considered scandalous were being spent on new public art, it was sad to see how neglected this interesting and increasingly valuable artwork had become. But this isn’t the only matter for concern, as even recent sculptures installed under the extensive, indeed expensive, public art programme in recent years are suffering a similar fate. Those who who drive, walk or cycle along Emu Bank will be aware of Konstantin Dimopolous’s “Dancers on the Lakefront”, installed in 2010 outside the Belconnen Arts Centre. Most locals were incredulous at the boldness of placing an art work in such an exposed position, but in 2010, it seemed to be more important about how things ‘looked’. 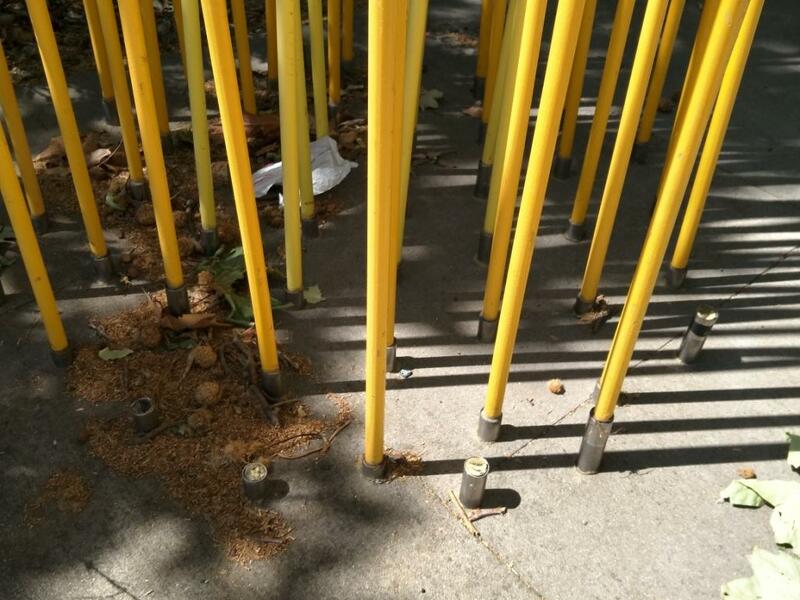 It ‘looked’ lovely for a while, but regular inspection shows it has not been possible to keep pace with the Friday night enthusiasm of the ‘lads’ swinging off the reeds, nor is there anyone in the adjacent Arts Centre obviously designated to maintain this installation. At last count at least 13 of the yellow ‘reeds’ were missing and rubbish and detritus were tangled at the base. 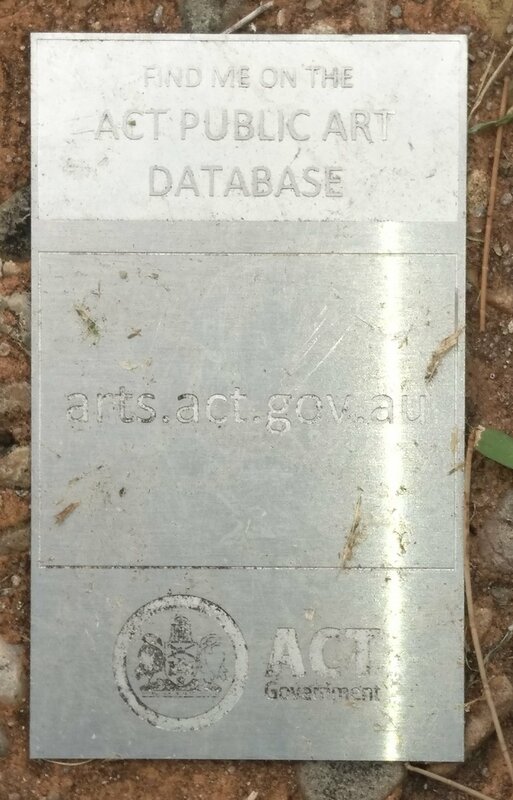 So if there is little or no money in the arts budget, and I am assuming it is an ‘arts issue’ as all public sculpture is listed on a database maintained by artsACT, what can be done to ensure these works of art are around for future generations? Whose responsibility is it to ensure that these major investments, funded by ratepayers’ dollars, are looked after properly? Without going into the whole messy and acrimonious issue of arts funding and the relentless round of ‘cunding futs’ that the arts and artists are subjected on a Territory and national level, there is the issue of the need for someone to take responsibility. And I don’t just mean an occasional random check. Who ultimately takes responsibility for custodianship of the cultural assets of Canberra? Let’s be positive and look at some possible solutions. 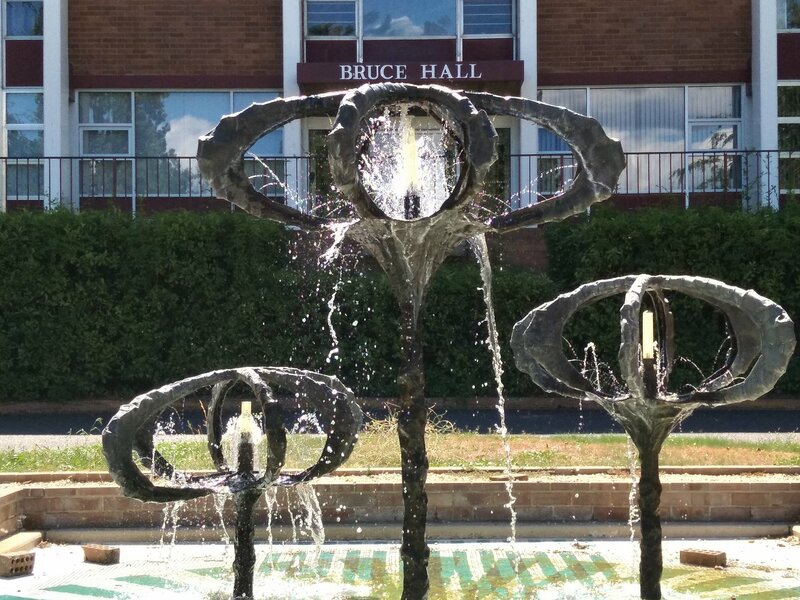 First, the ACT Government could put a moratorium on any new public sculpture and establish a “Futures Fund” for the repair and maintenance of what we have; and we do seem to have quite a few public sculptures in various corners of the Territory. Second, implement a reasonable ‘percent for art’ charge to developers in town centres as a contribution to the upkeep of infrastructure, including cultural infrastructure, that the increased number of residents will need, use and enjoy. A third option is the ACT Government could do an immediate review of the public art that it has and then think seriously about what will happen if something is not done. Some could be relocated; and I can image how well some would look in the ANU’s International Sculpture Park between Old Canberra House and the foreshore; and Bert’s ‘Tumbling Cubes’ could be co-located with his much loved “Cones” in the Sculpture Garden of the National Gallery. Some could be de-accessioned, and some could be repaired. Do we believe we, the people who live in Canberra, and the ACT Government, are custodians of the way Canberra will look in the future? Do we have a responsibility to ensure that we hand on Canberra in good condition? This doesn’t just include the obvious indications that we understood the principles of good town planning, the aesthetics of open spaces, and protection of the natural environment. What we also must not overlook is the heritage importance of the built environment, including buildings such as the Sydney and Melbourne Buildings, and sculptures like Bert Flugelman’s ‘Tumbling Cubes’, with some sort of management plan to hand them on in good order. This is the sort of thing for which we pay our rates, so the government can come up with what is necessary to ensure this imperative isn’t a want, but it is a very necessary need. 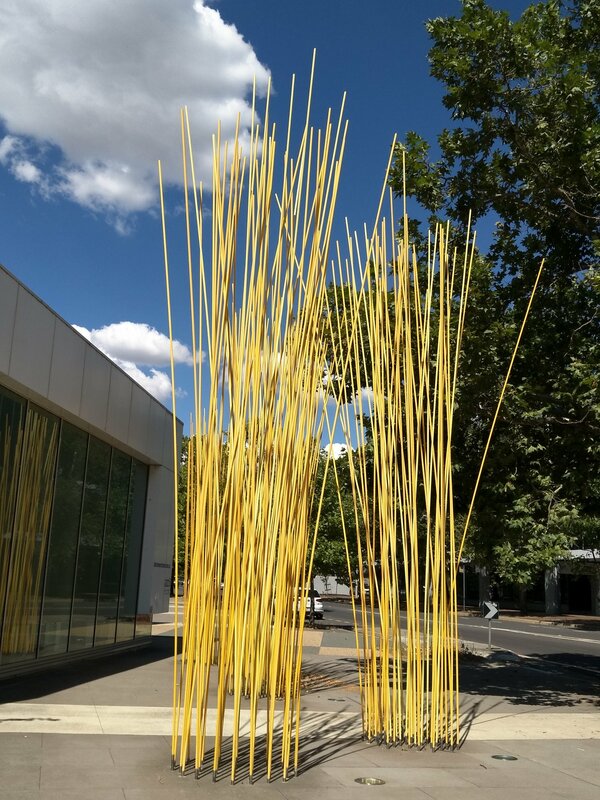 15 Feb: The ‘Gungarline’ public art display in Gungahlin Place is becoming infested with weeds and grass. Such a mess should not be allowed to become emblematic of this, the nucleus of the town centre. Try it – you might be pleasantly surprised. I am a long and optimistic user of “Fix My Street”. There are outstanding work orders on the following unresolved community issues: repair of damaged road signs to John James Hospital – removed and not replaced – 2015; damage and lack of maintenance of sculptures in Belconnen Town Centre – Tumbling Cubes 2014, and Kula’s Wave, 2016. The assumption you are making is that public art is for the benefit of the public. This is not correct. The funding of public art is purely for the benefit of artists and art lobby groups. It doesn’t matter whether the ‘art’ produced by the artists has any artistic merit or public appeal. If public art was produced for the benefit of the public there would be funds to preserve and maintain the art. But there are no such funds because the art is not worth preserving and was never produced to benefit the public. Once the artist has received the funds, what happens to the by-product is a minor consideration both to the artist and to the ACT Government. The best solution would be to stop paying second rate local artists producing their third rate unappealing, unsustainable bits of junk. The second best solution would be to continue paying the artists, but not to produce anything. That way both the artists and the public would benefit. The third best solution would be to pay the artists to produce their ugly bits of twisted metal and then have the works taken straight to a recycling centre so as not to add more visual pollution to the environment. Here is a perfect opportunity to “make the punishment fit the crime” for young offenders in society. Those caught doing graffiti or other wilful damage to private property can be made to work on cleaning up and even restoring the damage they and others have caused. Now that we’ve got the labour aspect worked out, we just need to find money for materials and someone to supervise the work to make sure they don’t run off before completing their task.